Socialist Democrat candidate for Congress Alexandria Ocasio-Cortez is taking her campaign for open borders even further to the political left, now saying that all border crossers and illegal aliens deserve a “right of passage” into the United States. Last week, Ocasio delivered an upset to establishment Democratic power player Rep. Joe Crowley (D-NY) in the district’s primary election, running on a platform that promises to abolish all immigration and border enforcement. Now, in an interview with AJ+, owned by the Al Jazeera Media Network, Ocasio says that not only should the U.S. abolish the Immigration and Customs Enforcement (ICE) agency — which is tasked with enforcing interior immigration laws — but that foreign nationals, border crossers, and illegal aliens are entitled to enter the U.S.
Ocasio is increasingly shaping the Democratic Party’s open borders platform ahead of the 2018 midterm elections. Since her beating of Crowley in the Bronx, Democrats in the House and Senate, along with progressive liberals like Cynthia Nixon in New York, have been demanding ICE be abolished and all immigration enforcement be ended. 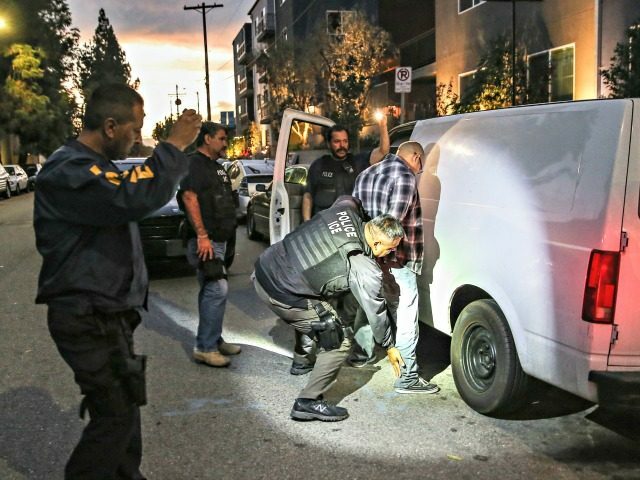 The latest Harvard/Harris Poll, though, reveals that swing voters are overwhelmingly opposed to the Democrats’ plan to end all immigration enforcement across the U.S. Nearly 3-in-4 swing voters, about 73 percent, said they do not want ICE to be disbanded, as Breitbart News reported. Less than 30 percent of swing voters said they support the abolishment of ICE. Abolishing the deportation agency, as Breitbart News reported, would have allowed more than 1.6 million illegal aliens to have gone free throughout the U.S. in the last five years.